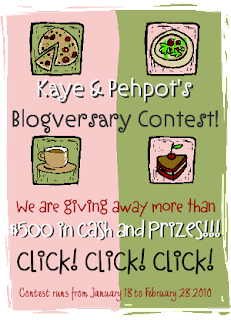 Kaye & Pehpot are holding their first anniversary contest. To qualify for the contest, you will need to blogging about it and review the four major sponsors. To know how gain more points, see full contest post. This giveaway runs until 18th of February 2010. I have added the sponsors' list here. Thanks! Milet, parevise po ng kaunti..